With sustainable design, world-class dining and the relaxing ambience, Bali's Waterbom has revolutionised the concept of the waterpark for today's savvy travellers. 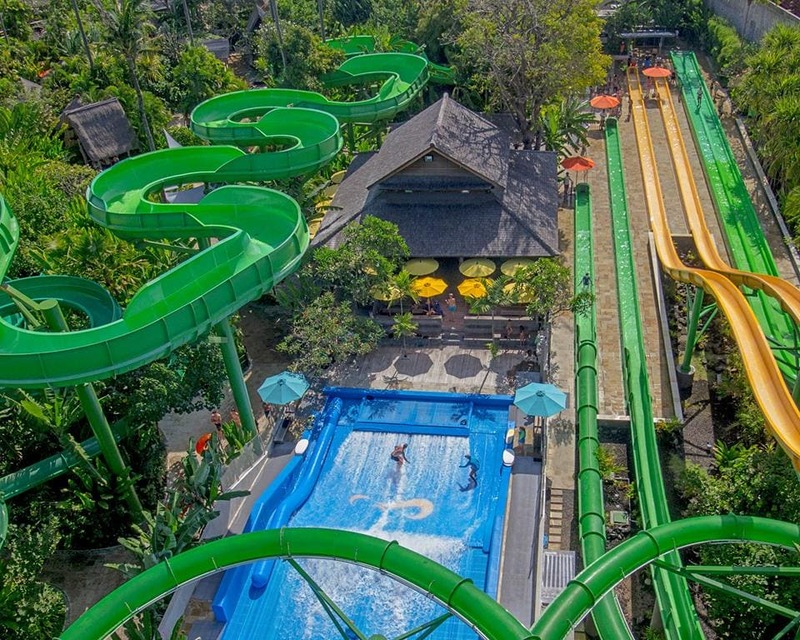 Bali, Indonesia - When we think of water parks, a few things are sure to come to mind: screaming kids, cheap junk food and plenty of neon-coloured plastic. Then there's Bali's Waterbom, a thoroughly grown up yet family-friendly premium lifestyle park that combines a ground-breaking environmental ethos with spa treatments, innovative, healthy cuisine and the island's best aquatic activities. Opened in 1993, award-winning Waterbom is the creation of Santo Gulino who strived to break the water park mould with a destination that combined great dining, private spaces, a sophisticated yet pro-family ambience, and some of the most heart-thumping water rides in the region. The result is a park that's more akin to a relaxing beach club than a water park; one that not only takes dining seriously, but which has worked hard to reach carbon neutral status while also leading the entire water park industry as the top water park in Asia in 2017 (Asia's Leading Water Park – World Travel Awards) and it has been Asia's number one water park by TripAdvisor Traveller's Choice Award, five consecutive years since 2014. Waterbom is the pioneer of a new movement in water park design, one which caters to today's informed and inspired traveller and offers them a one-stop-shop entertainment destination on the Island of the Gods. This premium lifestyle park's ground-breaking concept is modelled on the chic beach clubs that line Bali's coast. However, this sophisticated venue offers so much more than just great music and a compelling destination. Catering to everyone from solo guests and couples to groups and families, Waterbom has something for every traveller looking for fun under the sun. 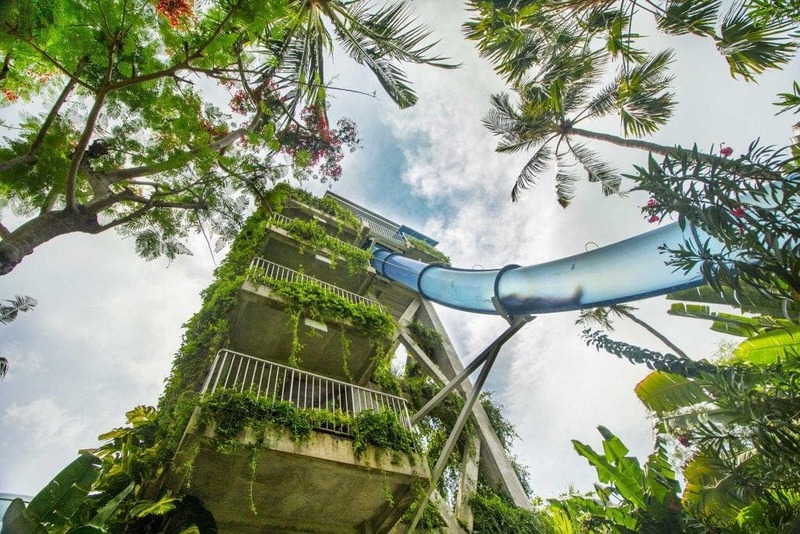 There are designated areas for children and adults to ensure visitors always get the experience they desire; there are adrenalin-pumping slides and rides – Waterbom's 85ft high Smash Down 2.0 was named top extreme trapdoor waterslide in the world by The Travel Channel – but also intimate, private gazebos, wellness treatment salas, and innovative contemporary dining outlets that cater to all appetites. 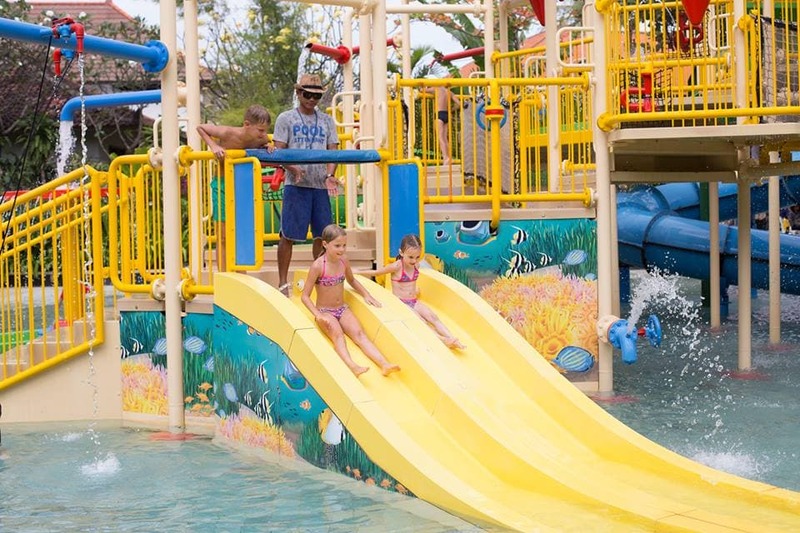 Waterbom's award-winning slides and rides cater to every water baby, from closely-supervised children's pools and world-class high-speed water slides to state-of-the-art wave pools and non-water activities. 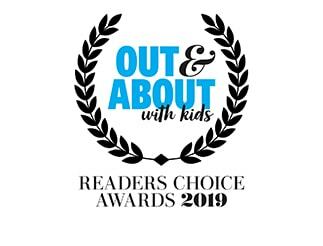 Families and groups will love the Python, a life-raft styled slide that winds its way through the python's belly; while the Constrictor, the world's longest slide at 250-metres and another raft ride, races through the upper canopy through near 90-degree turns. For something a little more exciting, try the raft-based Superbowl, which features a foaming cauldron in which riders race like a human roulette ball; or the popular Boomerang, which races raft-riders through a rainbow tube before they tackle a giant quarter pipe. If racing down waterslides isn't your thing, try your hand at Flow Rider, a cutting-edge wave pool that offers an exhilarating ride that combines surfing with the experience of skateboarding and snowboarding. If you prefer to battle it out with friends, the Water Blaster is a unique attraction that allows you to wage a water balloon war on someone special; while the Euro Bungy catapults revellers nine metres into the sky where they can practice their aerobatics under supervision. As part of its pioneering DNA, Waterbom was designed to not only compliment its stunning natural environment but, with careful environmental management, to enhance it. 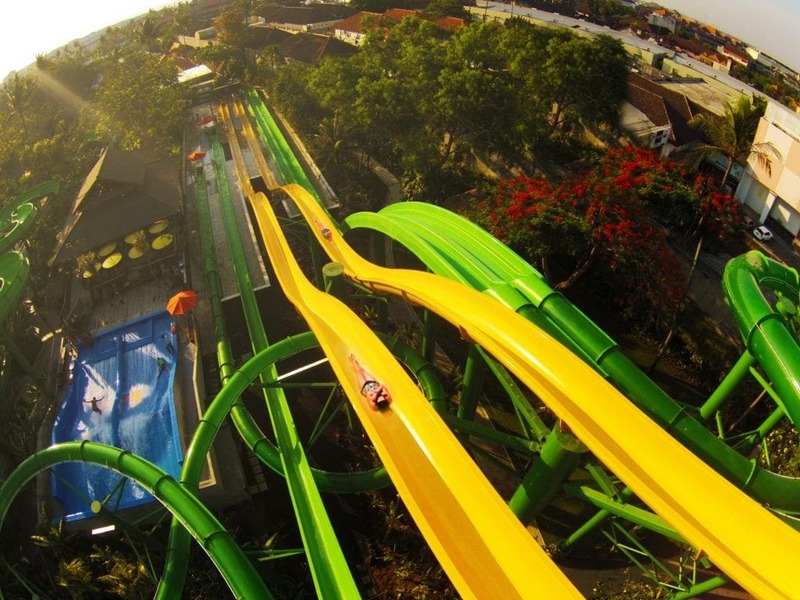 The 3.8-hectare park's world-class slides, which have been built and are maintained to strict international safety standards, are wreathed by natural landscape with native plants, allowing guests to experience the distinctive authentic lush tropical vibe; which belie a complex environmental management system that has seen Waterbom become the first tourism operation in Bali to reach carbon neutrality. As guests arrive they will immediately notice a drop in ambient temperature (approx. four degrees Celsius) compared to the street outside, a feat achieved by landscaping that makes up 50 percent of the park, and which plays home to many endemic and endangered species. In addition, recycled timber has been employed in the construction of restaurants and pavilions, and water sourcing and use is carefully monitored to ensure Waterbom maintains the strictest international sustainable credentials. Another revolution at the core of the Waterbom concept is an enhanced dining offering. Forget the usual stodgy fare you'd find at other water parks, Waterbom's culinary offering is both extensive and diverse, and ranges from hand-made 48-hour leavened pizzas through to fresh salads and healthy options for swimmers of all ages. All of Waterbom's food and beverage outlets conform to the park's sustainable philosophy; food is made fresh every day, with no GMO ingredients or MSG used. All salad and soya milk are organic, and all beef and chicken are halal certified. The park's menus are seasonally-inspired, and food is responsibly sourced, with ingredients from Waterbom's own gardens complementing the 80 percent of produce that is sourced from local markets, farms and fishermen, ensuring Waterbom also supports local Balinese producers. A total of seven food and beverage outlets ensure there's delectable dishes for every appetite, from Indonesian and Balinese classics and Italian pizza and pasta, to Mexican and Japanese favourites. In keeping with Waterbom's contemporary approach, a wide range of healthy dishes are available, from salads and fresh juices to smoothies, and a range of special dietary additions, including gluten and dairy free items. There's even Wantilan, a 'pork free' eatery with al fresco seating. Guests have an amazing variety of dining outlets and cuisines to sample from. 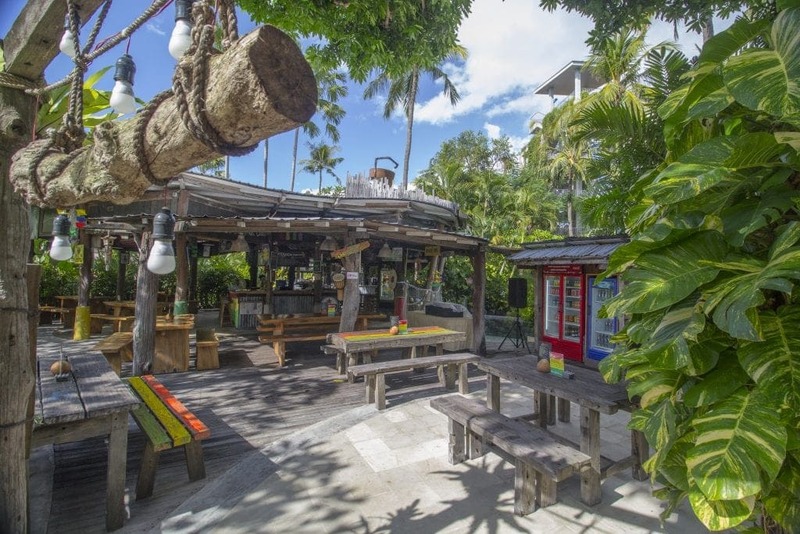 These include the Caribbean beach shack-inspired illy Coffee Shop & Bakery, home to homemade cakes, cookies, doughnuts and pastries (including vegan and gluten-free options); burgers, Vietnamese bahn mi sandwiches, salads, grilled meats, traditional sundaes and homemade ice cream, barista coffee, draught beer and Tiki rum cocktails at the The Shack, inspired by the beach shacks concept in the Caribbean with a rustic and easy-going vibe, which was built using upcycled driftwood and recycled timber; and long-pulled pizzas and a create-your-own-sandwich bar as well as Indonesian favourites and children's snacks at the poolside Bali Banana. For Thai and Italian street food, including pizza, pasta, roti and noodles, fresh salads and juices, and a dedicated margarita bar, head to Thaitalian; or for classic cocktails and fresh juices make a beeline for the Pool Bar. Click here for dining outlets details. The result is a water park that breaks with tradition and defines the future of water theme parks globally, while offering today's travellers an intelligent and sustainable holiday solution.